Nuts are a wonderful source of protein and good fats, and are a terrific snack, as long as you don't eat too many (see my post here about how many nuts equals 200 calories). Raw nuts that are not roasted in oils and then salted are best. But sometimes they just taste . . . raw. And they can irritate the lining of your mouth. Here is a recipe for toasting nuts that doesn't add any unhealthy fats or salts and tastes so delicious. This method of soaking and then slowly drying makes the nuts easier to digest and their nutrients more readily available, according to the book Nourishing Traditions by Sally Fallon, from which this recipe comes. These are crispier than raw (hence the name), and are delicious! And good to know they are more digestible and nutritious as well. I bought some daisies at the grocers this weekend. I haven't bought flowers in weeks as it has been so frigid out that I've been afraid the poor things would freeze to death on the way home. This cocoa pot (made in Germany) is more than 100 years old, and came from my great-grandmother. Here it is for show only, as I'm afraid to pour boiling hot liquids in it. I love the colors. And I finally gave up on displaying my little piles of linen napkins here and there, and have them tidily organized in this hanging shoe holder. Love it. Now all my linens are in one place, and I know exactly what I have. The sun is shining and it's a balmy 34 F out, the warmest it's been in like . . . forever. Maybe March won't be quite so cold. What's it like in your neck of the woods? Hi Deborah ...what a pretty post. Love to see daisies again. They have always been my favorite flower. Sounds like you are having wonderful weather. It is still cold in Ontario but spring is in the air. Lovely post, my friend. And thanks for the tip and information about the nuts. Hugs to you! What a gorgeous cocoa pot and overall table setting you have! We have EXACTLY the same temp here in WV, as I write this comment, and it's supposed to warm into the 50s (but with rain) the next two days. 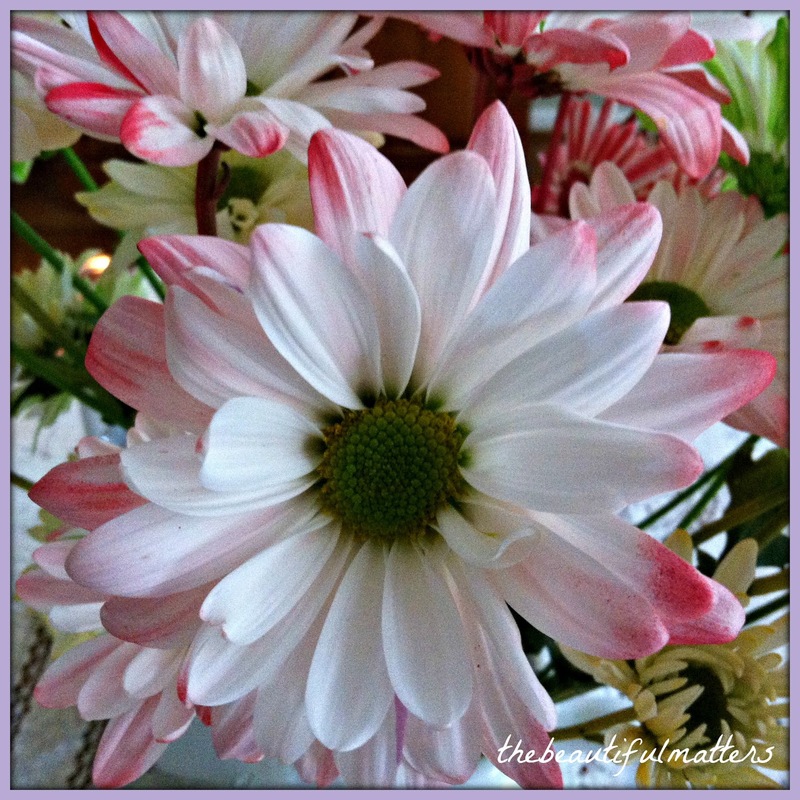 I also got a pick-me-up bouquet at the grocery (yesterday) - daisies, a few tulips & daffs. 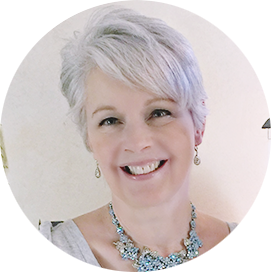 It was raining, and as I brought them inside, I slipped on the tile floor and fell flat on my rear. At this age, I could've broken something easily but, thankfully, I was ok. A couple flowers got pulverized against the wall as a result, but the rest are still pretty. :) Have a beauty-full week, Deborah. Your method of storing napkins is brilliant! I love that idea and will soon be implementing it in my own home. Thank you! In my neck of the woods, we just got 15 cm more of snow on top of what we already had. Hubby and I are so sick of winter, believe me! We usually don't complain but it has been unusually difficult this year with one issue after another. I'm so glad spring is coming! Your cocoa pot is beautiful and what a treasure! I like how you have put your linens into the holder. If I had room, I would consider doing the same thing; great idea! Your teacup is a pretty one and your images are simply lovely to look at. Thank you for sharing and joining me for tea today. Happy March! I love nuts and am sad the calorie count is so high. What is the purpose of soaking the nuts before toasting them? I've heard this before, but never knew why it was necessary. Terrific idea with the napkins!! Stealing the idea too. 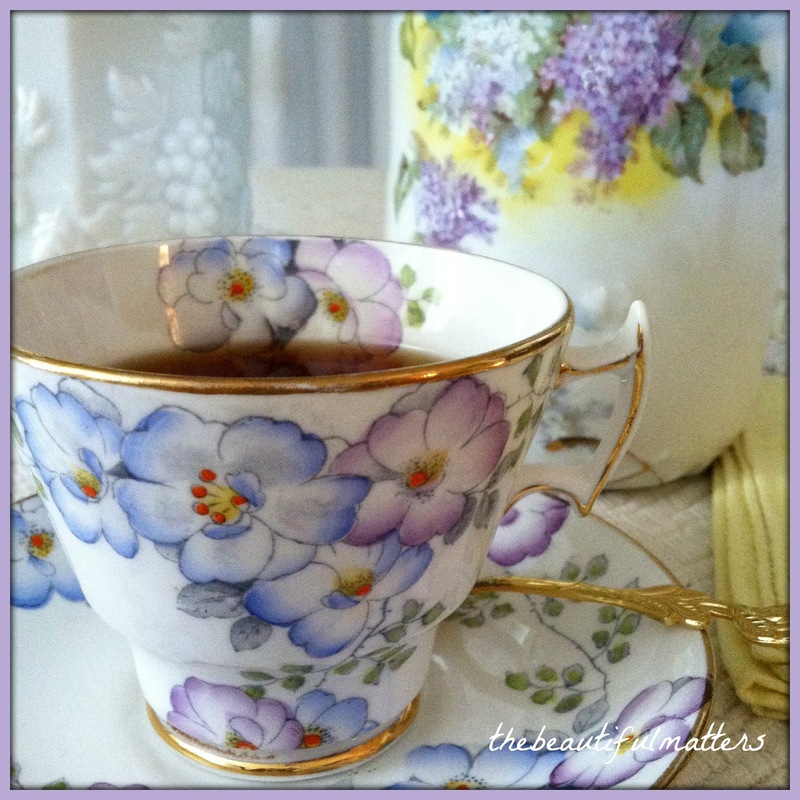 Love the purple flowers on your pretty teacup! 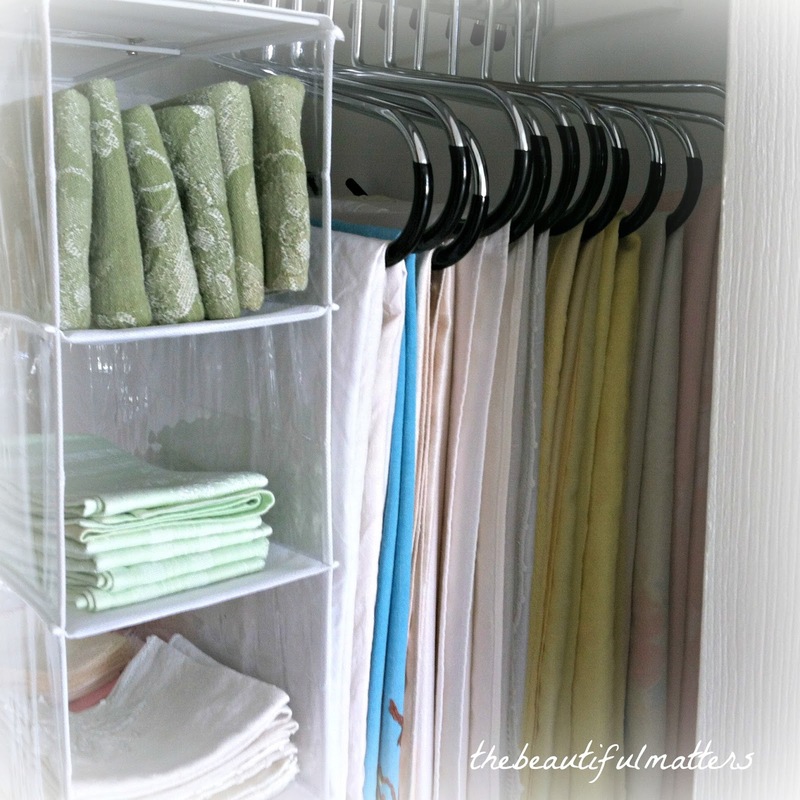 Using a hanging shoe holder to store linens is a brilliant idea! The temperatures in Ontario is still below zero Celsius, but the days are getting longer. Hooray for more sunlight! It makes perfect sense that roasted nuts would be more flavorful, but I had not known that they would also be easier to digest. Must remember this tip. I had to smile to see your great-grandmother's cocoa pot knowing how much I love my great-grandmother's cocoa pot. Wonder how many of us out here own such a family treasure. I imagine that we may be in a select club. =D Yours really is lovely! Mmmm I'd love a handful of those crispy nuts, Deborah! 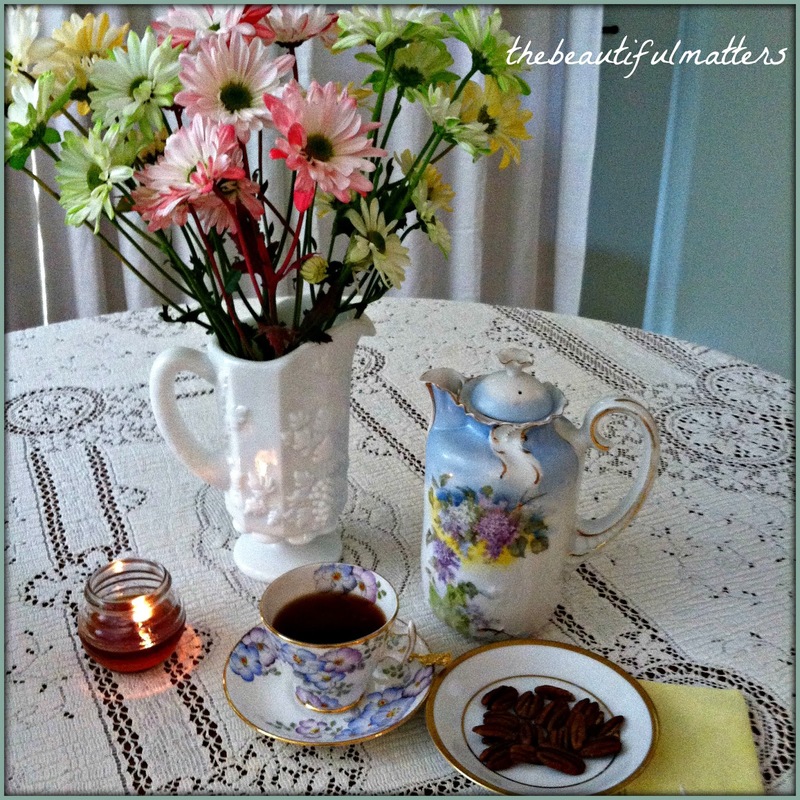 Your tea looks so pretty with your lovely setting with the cheerful posies. I'd love to store my napkins like you've done. It looks so nicely organized and your tablecloths, too. 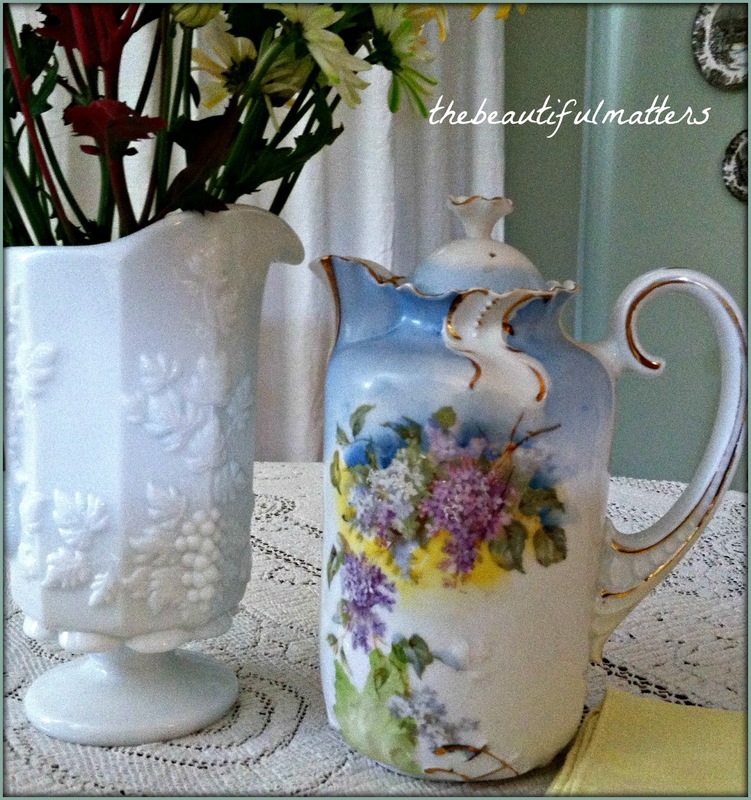 Love your hand colored on transfer teacup! 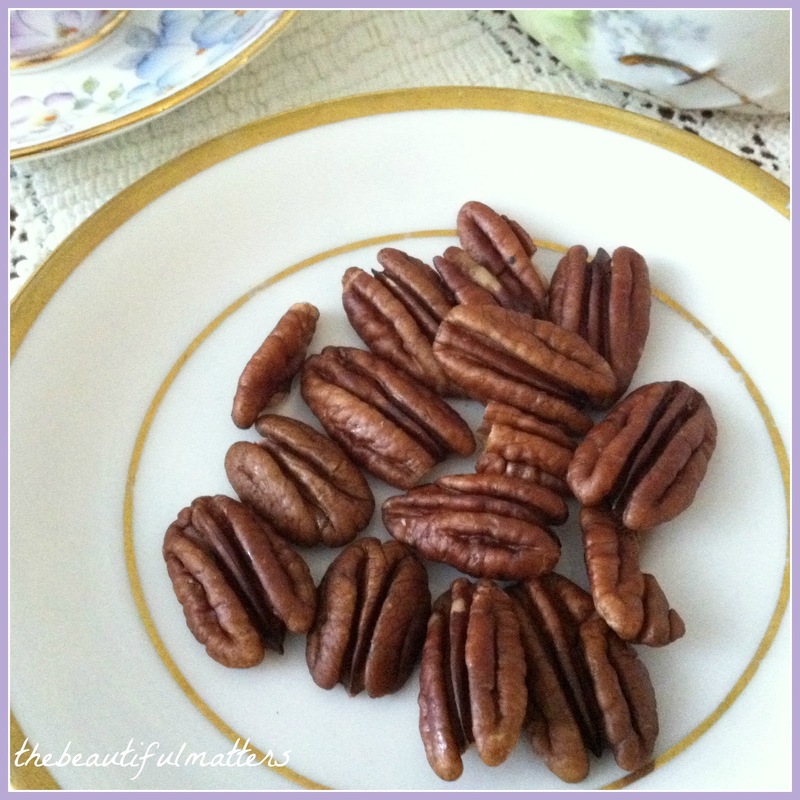 I love nuts...good recipe, nice and simple! Keep warm...we have the unseasonable warmth over here! Unsalted nuts we eat every afternoon with our tea but I would not soak them in salt water as for sure that does add the sodium to your nuts. They look appealing though! Your linen closet is genial for using a shoe holder. I know what you mean...where 30 feels balmy! 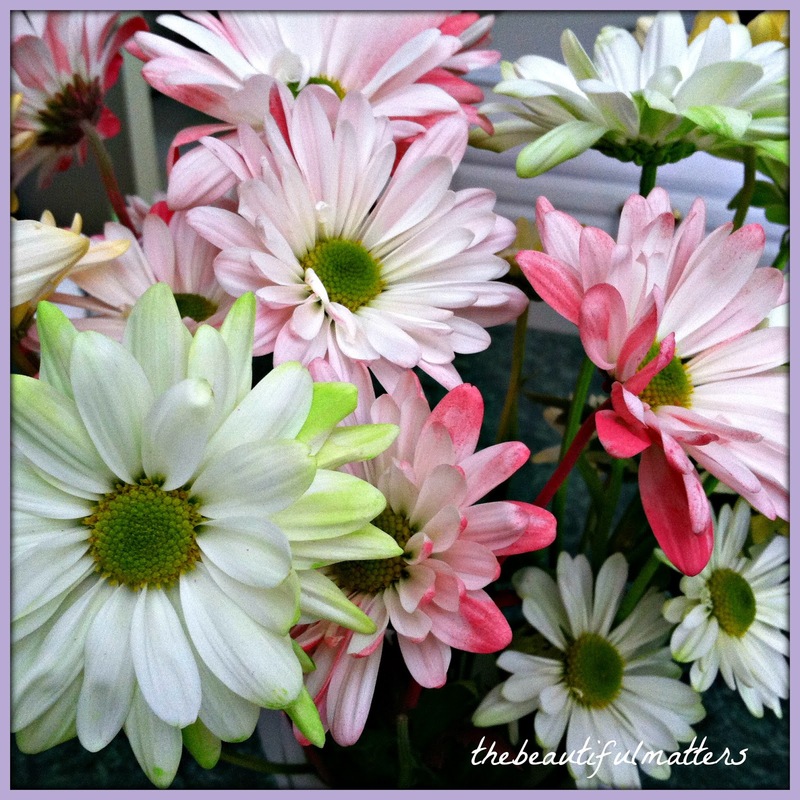 Love the pretty daisies with their variety of hues. Hi Deborah. Glad things are warming up a little for you. Your tea set/chocolate pot is so pretty. What a treasure. 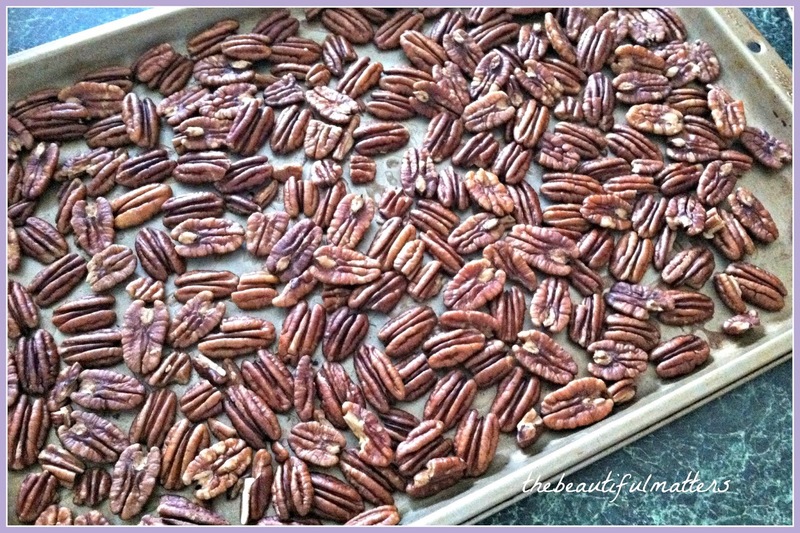 I love snacking on nuts and will be trying this method of roasting. You have a lot of pretty linens for your table, and I like how you have organized them. Your chocolate pot is amazingly beautiful!!! :) What a treasure! I enjoy nuts too; thanks for your recipe. It's a good thing to eat healthy, although not always easy! Your chocolate pot is a real treasure. Thx so much for the info on roasting nuts. My husband is diabetic and nuts are one of the few things he can have! I like roasted nuts, but would omit the salt. Your linens are so well organized! I have to cram mine into an inadequately tiny cupboard ... really lacking storage space in our house. Your cocoa pot is beautiful, and is such a treasure to still have it. I would be afraid to use it too. Hi Deborah, The roasted nuts sound so good. I would love to try this. 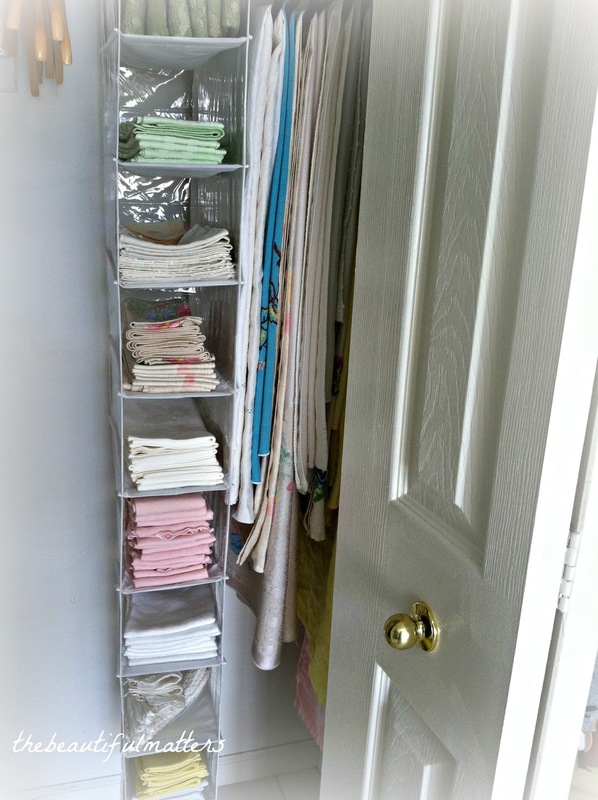 I also really love the clothing racks to hold your napkins and other linens. We are in the process of painting closets this week being back home and I was just thinking I need to add these for just the same thing. I love to be organized. Love your chocolate pot. What a gorgeous design. Thank you for stopping by while I was away and thank you for the birthday greeting. We are in another winter storm here with sleet and very cold temps. Ready for springtime hopefully soon. Hi Deborah, thanks so much for sharing this nice recipe for crispy nuts. I will have to give this a try. I bet they are delicious. Hope you are staying warm. Have a nice Friday and weekend. I love your idea on using the shoe holders to put special napkins, etc. in. I have two of those shoe holders and now they are being used as yours are. I have a free standing closet that is portable. I use it to hang my table runners and tablecloths on. Now the two shoe holders are added; one on each side. It is the perfect solution. Thank you so much for sharing. After being away for awhile I had to come for a visit and see how you have been. I appreciate your recipe here on the nuts and I am going to give it a try for sure. I eat raw nuts a lot for a source of protein. You have been a busy bee cleaning and organizing areas in your home, I commend you. Everything is looking so neat and simple. Great idea using the shoe bag for your linen napkins. It's nice to be able to use items that are easily assessable, isn't it? I find I will use them more often when I can get to them. 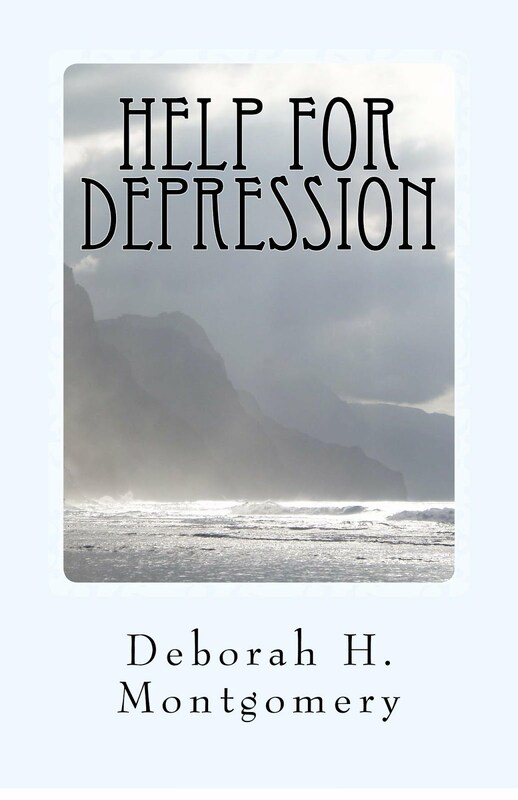 Your cocoa tea pot is just lovely Deborah! Very different from an ordinary tea pot.